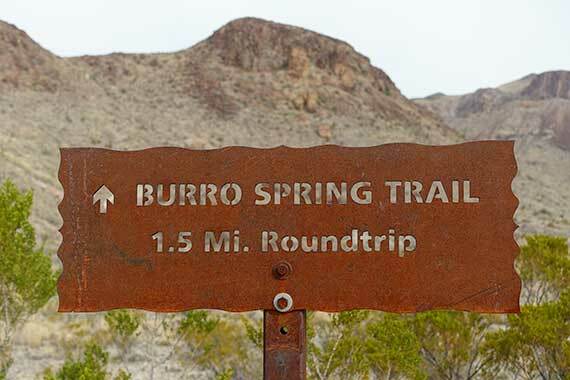 Burro Spring Trail is a lightly traveled trail, just down the road from Burro Mesa Pour-off, that ends at a cliff overlooking the lush green area around Burro Spring. The book Hiking Big Bend shows the trail as a loop around the hill, but on my trip I just couldn’t see a safe path down to the spring itself. Additionally, most other materials I’ve seen on the trail, such as Google Maps and Garmin Basecamp, show it as an out-and-back trail. I hiked this trail solo, so I didn’t want to take too many chances trying to navigate to the bottom of the spring. Next time I hike it with somebody, I’ll see about finding a path down. In the meantime I would recommend turning back at the cliff. 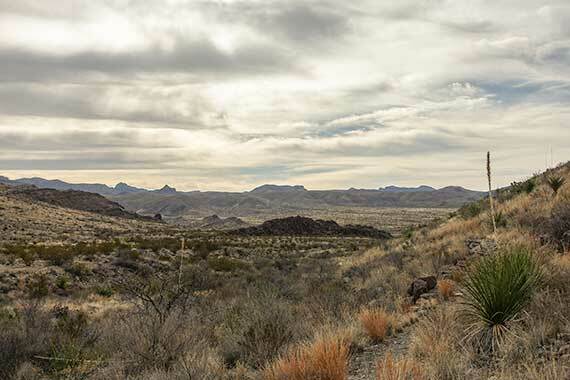 To get to the trailhead for Burro Spring Trail (29.230796, -103.417781), take a left out of Park Headquarters at Panther Junction and drive approximately 13 miles to take a left hand turn onto Ross Maxwell Scenic Drive to Castolon. From there, you’ll need to drive about 11.3 miles to a right hand turn for Burro Mesa Pour-off (29.219886, -103.414632). Take this paved road about 1.1 miles until you see a pull off on the left hand side of the road. The trailhead is at this pull off. Don’t be fooled by the trailhead marker. This trail is not a 1.5 mile round-trip. 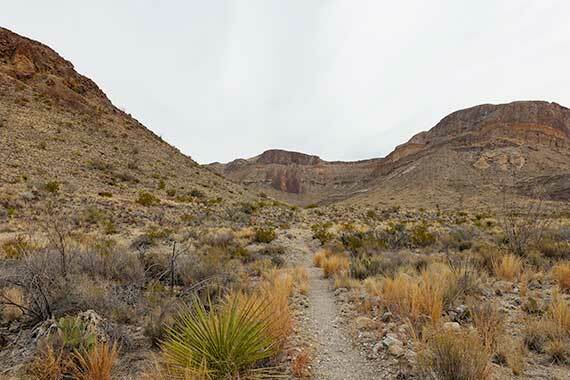 My GPS measured it at 2.3 miles round-trip, I measured it in Arc Explorer at 2.26 miles, and the book Hiking Big Bend, by Laurence Parent , shows it at 2.2 miles. That’s an extra 0.8 miles, not a lot to some hikers, but it may be more than others want to deal with. 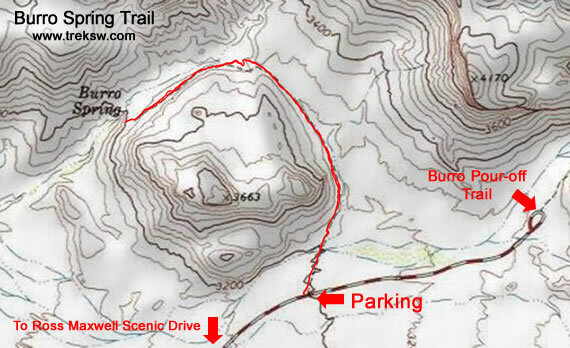 From the parking lot, you’ll hike toward the right side of the mountain, crossing several dry washes before you reach it. As you start winding your way around the mountain, the road will fall out of sight and you’ll get that feeling of isolation that Laurence Parent talks about in his hiking guide. 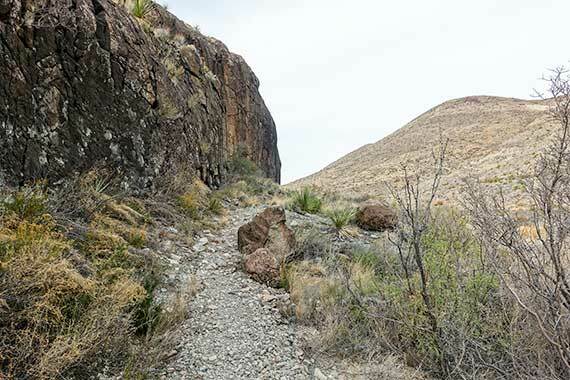 Once you start rounding the backside of the mountain, the trail will start descending into a dry wash. Be careful at the top of the descent, the trail gets a bit narrow with some loose rock that can make the footing a little difficult. Once you get down the descent, the trail will hug the cliff on your left with the dry wash a little distance off to the right. With the shade offered by the cliff walls, this is a great place to sit and relax a bit. Just look out for snakes staying cool in the cracks and crevices around the rocks. 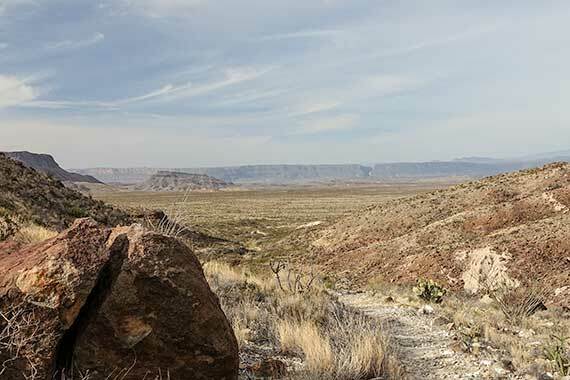 As you continue on, Santa Elena Canyon will start to become visible miles in the distance. 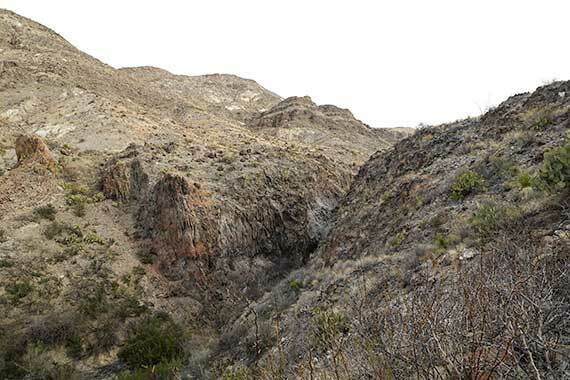 Once you get the the cliff’s edge, Burro Spring will come into sight. 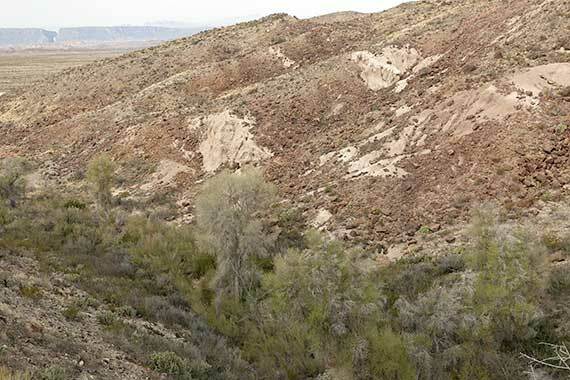 You’ll see tall cottonwoods and other dense vegetation in the valley below. As you can see in the picture below, it’s fairly steep. Again, I don’t recommend continuing on from here.